This is a Universal Access Trail hike. It is almost level and wheel chair capable. The entire trail system is only 1.5 miles. There a several benches to rest on. And there are a number of signs explaining the uniqueness of a logging community and operation. This hike is just off Forest Road 43 at the end of FR 417. The hike is only a half mile from the Bunker Hill hike. Next to this interpretive trail is located the Wind River Canopy Crane Research Facility. The crane itself can be seen from this trail. The purpose of this project is to enable researchers to investigate the environment at and near the top of the old growth forest which surrounds the crane. Continue north on the Wind River Highway (FR30) for about 8.6 miles to the little community of Stabler and the junction with Forest Road 43, also called Hemlock Road. Turn left onto FR43 and cross a bridge over the Wind River and continue west for a couple of miles to the junction of FR43 and Forest Road 417. 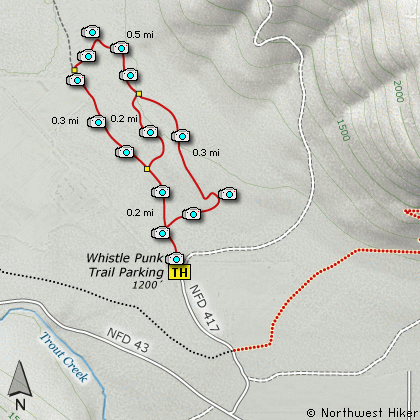 Turn right onto	FR417 and follow it but a short distance to the end and the trailhead for this hike.